Fortuna Düsseldorf v Bayern — Bayern München crushed Fortuna Düsseldorf 4-1 MERKUR SPIEL Arena in a result that was never in doubt. Kingsley Coman scored twice in the first half before Serge Gnabry made it 3-0 after the break. Substitute Dodi Lukebakio converted a late penalty before Leon Goretzka finished from close range in added time. The result sees FC Bayern regain their one-point lead over Borussia Dortmund at the top of the Bundesliga table. The champions took a few minutes to get going and looked to be targeting Kaan Ayhan early on who was playing in an unfamiliar position at left-back. Joshua Kimmich and Serge Gnabry combined on two occasions; the second saw Gnabry’s cross deflected off the post by Kingsley Coman. Thiago Alcántara then headed a Kimmich cross wide before FC Bayern took the lead 15 minutes in. Gnabry found Coman in space on the left-wing, the Frenchman’s cross evading Thomas Müller and Michael Rensing and finding the net. Javi Martinez robed Kevin Stöger in the middle of the pitch, setting off on a surging run into the box where his shot was blocked. Ayhan picked up the first caution of the match with Düsseldorf’s left edge looking increasingly vulnerable. Martinez combined with Müller who drew a foul in a dangerous position, Robert Lewandowski stepping up for the free kick that narrowly missed the top corner. Bayern were in complete control with their individual quality and collective understanding shining through. Fortuna Düsseldorf fashioned their only significant chance of the first half in the 26th minute. Benito Raman robbed Mats Hummels, broke free and fed Dawid Kownacki who saw his shot deflected over the bar from Niklan Süle’s intervention. From the resulting corner, Bayern broke free with Lewandowski unable to get a shot away. Müller was becoming influential, finding space around the pitch and looking to get onto balls behind Fortuna’s defence. Another Bayern counter-attack saw Coman cut inside from the left wing and test Rensing with a fierce strike. The Bavarians didn’t have to wait long to extend their lead which came in the 41stminute. A simple move saw Gnabry release Kimmich around the Düsseldorf defence, Coman ghosting in to finish his cross past a helpless Rensing who could only look on and admire the sublime football that cut his team to shreds. Müller cut inside with his shot blocked, Ayhan’s afternoon going from bad to worse as he picked up an injury that required attention. There was still time for Niko Kovac’s side to fashion another chance before the break; a Kimmich corner met by Martinez who tested Rensing with a powerful header. Funkel made no changes at half-time with Dodi Lukebakio, who scored a memorable hat-trick in the 3-3 draw in Munich earlier in the season remaining on the bench. Normal service was resumed as Müller beat Marcel Sobottka, his cross aimed at Lewandowski falling to Thiago who drew a fine save from Rensing. Manuel Neuer had to be replaced by Sven Ulreich in the 53rdminute after picking up an injury. It mattered little as his involvement was minimal and two minutes later Bayern made it 3-0. Thiago’s corner was flicked on by Müller with Serge Gnabry tapping in from close range. Thiago then had a shot of his own, steering Coman’s cross towards the far post which forced a save from Rensing. Funkel made his first substitutions of the game in the 68thminute with Alfredo Morelos on for Sobottka in central midfield and Lukebakio replacing Rouven Hennings up front. Kovac made his second switch with Müller replaced by Leon Goretzka. Gnabry was looking increasingly dangerous against Ayhan, Kimmich next no get behind the troubled Turkish defender who almost gave away a penalty after Gnabry had made a run past him into the box. Both managers made their final changes in the 80thminute with Gnabry making way for James Rodriguez, and Kownacki replaced by Takashi Usami. A Kimmich cross was headed over the bar by Thiago as the Düsseldorf supporters started streaming out of the stadium. Those who remained were given something to shout about when Matthias Zimmermann’s cross was kicked into Mats Hummels’ arm by Thiago. Referee Felix Zwayer consulted VAR and the touchline monitor before awarding the hosts a penalty. Lukebakio stepped up and sent Ulreich the wrong way, the euphoria in the stadium resembling that of a winning goal. Bayern weren’t finished, however, Lewandowski’s cross falling to Goretzka with the substitute making no mistake from close range. Kingsley Coman got the ball rolling with two goals, but Joshua Kimmich was devastating throughout in Düsseldorf. Drifting inside, overlapping with Gnabry and solid in defence, Fortuna had no answers for Bayern’s right back who was the most influential player on the pitch. With Jean Zimmer, Niko Gießelmann and Markus Suttner all unavailable Friedhelm Funkel had a problem at left-back. Central defender Kaan Ayhan had to fill the gap which was always going to be a big problem against the Bavarians. 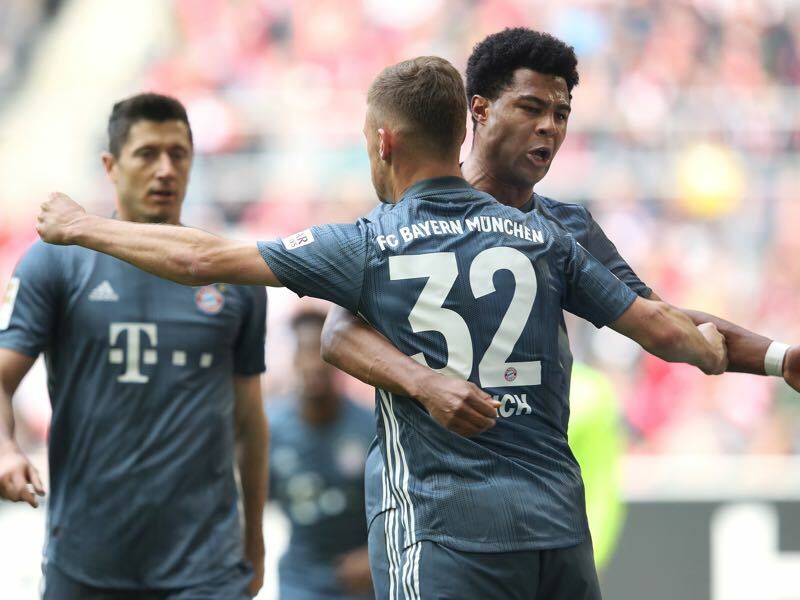 So it proved as Serge Gnabry, and Joshua Kimmich tormented him for most of the match, he was simply unable to prevent the waves of attack coming his way. Ayhan has been one of Düsseldorf’s best performers this season, but in an unfamiliar position against the best team in the Bundesliga, he can be forgiven. For the first time, Kingsley Coman has scored five goals in one season in the Bundesliga, scoring these in his last six appearances. Bayern have won all 11 games in which Coman scored. Serge Gnabry has had a hand in seven goals in his last five games in the Bundesliga.